Scores 31 Highway MPG and 22 City MPG! This Chevrolet Camaro delivers a Gas I4 2.0L/122 engine powering this Automatic transmission. WHEELS, 18 (45.7 CM) SILVER-PAINTED ALUMINUM (STD), TRANSMISSION, 8-SPEED AUTOMATIC includes transmission oil cooler and (BTV) remote vehicle starter system, TIRES, 245/50R18, BLACKWALL, ALL-SEASON (STD). *This Chevrolet Camaro Comes Equipped with These Options *TECHNOLOGY PACKAGE includes (IOS) Chevrolet Infotainment 3 Plus system, 8 diagonal HD color touchscreen and (UQA) Bose premium speaker system , TIRE INFLATION KIT, SEATS, CLOTH FRONT SPORT BUCKET (STD), REMOTE VEHICLE STARTER SYSTEM, REAR AXLE, 3.27 RATIO, PADDLE-SHIFT MANUAL CONTROLS, MOSAIC BLACK METALLIC, LT PREFERRED EQUIPMENT GROUP Includes Standard Equipment, LPO, ALL-WEATHER FLOOR MATS, JET BLACK, SEAT TRIM. 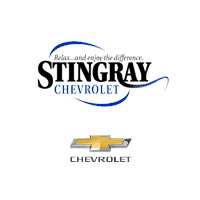 * Stop By Today *A short visit to Stingray Chevrolet located at 2002 N Frontage Rd, Plant City, FL 33563 can get you a reliable Camaro today! Scores 31 Highway MPG and 22 City MPG! This Chevrolet Camaro boasts a Gas I4 2.0L/122 engine powering this Automatic transmission. WHEELS, 20 (50.8 CM) 5-SPOKE CARBON FLASH PAINTED ALUMINUM, TRANSMISSION, 8-SPEED AUTOMATIC includes transmission oil cooler and (BTV) remote vehicle starter system, TIRES, 245/40R20, BLACKWALL, ALL-SEASON, RUN-FLAT. *This Chevrolet Camaro Comes Equipped with These Options *TECHNOLOGY PACKAGE includes (IOS) Chevrolet Infotainment 3 Plus system, 8 diagonal HD color touchscreen and (UQA) Bose premium speaker system, RS PACKAGE includes (RQ9) 20 5-split spoke premium Gray-painted, machined-face aluminum wheels, LED taillamps, RS-specific grilles and (D80) decklid-mounted lip spoiler , SPOILER, DECKLID-MOUNTED LIP SPOILER, SEATS, LEATHER-TRIMMED FRONT SPORT BUCKET (STD), RIVERSIDE BLUE METALLIC, REMOTE VEHICLE STARTER SYSTEM, REAR AXLE, 3.27 RATIO, PADDLE-SHIFT MANUAL CONTROLS, LT PREFERRED EQUIPMENT GROUP includes standard equipment, LPO, ALL-WEATHER FLOOR MATS. * Stop By Today *Come in for a quick visit at Stingray Chevrolet, 2002 N Frontage Rd, Plant City, FL 33563 to claim your Chevrolet Camaro!